For nearly 20 years Cristo Rey Community Center has provided a Thanksgiving meal to those in the community in need. 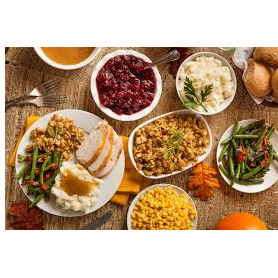 Join us in creating and serving a wonder Thanksgiving Feast to our neighbors. Volunteer options include both food donations and opportunities to work the day before/day of Thanksgiving. All openings are listed below, scroll until you find the perfect match for you and your family! Please note we ask all food to be prepared "serving ready" as we will be reheating and immediately providing to our guests No frozen or raw items, please. Also, all volunteers the day of the event are asked to attend a short training session on Monday, November 21 at noon (in the gym at CRCC). This will ensure the day will run smoothly for our guests and us! Once registered you will be sent a short volunteer waiver form. Bring your magic peeler! We will be peeling, cutting and preparing pounds of potatoes for our guests. Please provide a 5lbs-8lbs ham in the original packaging. Please fully cook your dish prior. We will be heating and serving the food only. Please fully cook your dish prior. We will be heating and serving the food only. Log in to see who is volunteering for Cristo Rey Community Center Thanksgiving Feast!